that creates a set of recommendations and then fast tracks them through Congress. In general, the idea behind these proposals is that Congress can’t change the commission’s recommendation: It just votes up-or-down. Well, I don’t fear this, and I don’t think Pelosi and Reid should fear it either. It’s true that my first choice is to do nothing for now and wait a decade or so to see how our finances shape up. Trying to project 50 years in the future is dimwitted and we shouldn’t pretend we can do it. But the politics is a little bit different. Even Republicans agree that privatization is off the table right now, which means that a bipartisan commission might very well come up with an acceptable set of tweaks that would balance Social Security’s books. And there’s a genuine upside to this: at a fairly low cost it would take Social Security off the table for good. No more endless whining from Pete Peterson and the Washington Post editorial board. No more Republican kvetching about Social Security bankrupting America. No worrying about yet another privatization plan rearing its zombie head the next time a Republican is in the Oval Office. 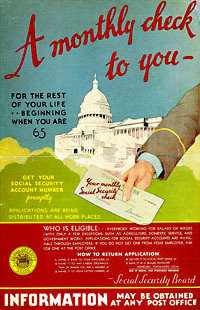 No more polls showing that more kids believe in UFOs than believe they’ll get a Social Security check when they retire. And Barack Obama would get a very nice post-partisan fiscal responsibility feather in his cap. So I say, give it a try. If the commission proposal is no good, vote it down. If it’s OK, pass it. And then we can spend the next eight years working on real long-term issues like healthcare and climate change. What’s the harm in letting Steny give it a try?